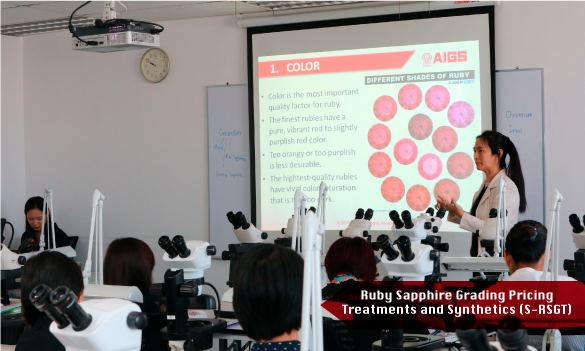 To give students maximum exposure to the mainstream synthetic ruby sapphires as well as their natural counterparts. Given various techniques used in separating natural, synthetic, assembled and treated ruby sapphires and to provide maximum exposure to the inclusions of these gems within the time constrains of the course. This course is designed to provide a basic structure upon which to build. It includes the mechanics and practice of ruby sapphire grading available. The basis of quality analysis for any transparent gem are the four C's - color, clarity, cut and carat weight. To grade and appraise accurately, you will need to learn how to view and judge all characteristics that combine to produce the "four C's". But, you also will need to develop a knowledge of the gemstone market. Pricing is learned first and foremost through actual marketplace experience. Access to reliable market information, building up negotiating skils, and consistant presence in the gem market eventually produce an experienced gem dealer. Various techniques used in separating natural, synthetic, assembled and treated ruby sapphires and to provide maximum exposure to the inclusions of these gems within the time constrains of the course. The basis of quality analysis for any transparent gem are the four C's - color, clarity, cut and carat weight.